Chris Bosh is one of the six owners of the California-based promotion Pro Wrestling Guerrilla, collectively known as the “PWG Six”..
February 22, 2004–Pro Wrestling Guerrilla: Chris Bosh & Scorpio Sky & Quicksilver b Super Dragon & Excalibur & Disco Machine..
March 27, 2004–Pro Wrestling Guerrilla: Quicksilver & Chris Bosh beat Joey Ryan & Scott Lost to win the Tag Team titles..
April 17, 2004–Pro Wrestling Guerrilla: Super Dragon & Excalibur beat Chris Bosh & Quicksilver..
September 4, 2004–Pro Wrestling Guerrilla: Chris Bosh won three-way over Quicksilver and Hook Bomberry..
September 11, 2004–Revolution Pro Wrestling: Quicksilver & Scorpio Sky beat Chris Bosh & UK Kid..
October 9, 2004–Pro Wrestling Guerrilla: Scott Lost & Chris Bosh beat B-Boy & Super Dragon to retain the PWG Tag Team titles..
October 16, 2004–Revolution Pro Wrestling: Joey Harder beat Chris Bosh (forfeit, match never took place, Bosh claiming injuries)..
October 23, 2004–Pro Wrestling Guerrilla: Scott Lost & Chris Bosh beat Scorpio Sky & Quicksilver by Disqualification..
December 18, 2004–Pro Wrestling Guerrilla: Scott Lost & Chris Bosh defeated Ricky Reyes & Rocky Romero by Disqualification..
January 22, 2005–Pro Wrestling Guerrilla: Scott Lost & Chris Bosh defeated Los Luchas..
January 29, 2005–AWS: Super Dragon & Lil Cholo & Quicksiliver & Sara Del Rey b Ronin & Chris Bosh & Steve Pain & Joey Harder..
February 12, 2005–Pro Wrestling Guerrilla: Scott Lost & Chris Bosh beat Scorpio Sky & Quicksilver to retain the tag team titles..
February 19, 2005–AWS: Scott Lost & Chris Bosh defeated Ronin & Super Dragon..
February 27, 2005–Pioneer Wrestling: Chris Bosh & Scott Lost & Ronin defeated Topgun Talwar & Phoenix Star & Zokre..
March 12, 2005–Pro Wrestling Guerrilla: Arrogance (Scott Lost & Chris Bosh) defeated Frankie Kazarian & Joey Ryan..
March 19, 2005–AWS: Chris Bosh & Scott Lost defeated Topgun Talwar & Ronin..
April 1, 2005–Pro Wrestling Guerrilla: Quicksilver & Scorpio Sky & Frankie Kazarian beat Joey Ryan & Scott Lost & Chris Bosh..
April 2, 2005–Pro Wrestling Guerrilla: Chris Bosh & Scott Lost defeated Frankie Kazarian & Chris Sabin to retain the Tag Team titles..
April 9, 2005–SCCW: Scott Lost & Chris Bosh defeated Super Dragon & Phoenix Star..
May 14, 2005 – CZW Best of the Best: Super Dragon defeated Chris Bosh in the FIRST around of the BOTB Tournament..
May 13, 2005–Pro Wrestling Guerrilla: Scott Lost & Chris Bosh beat Disco Machine & Mr. Excitement to retain the Tag Team titles..
June 11, 2005–Pro Wrestling Guerrilla: Chris Bosh & Scott Lost beat Hook Bomberry & Top Gun Talwar to retain the Tag Titles..
June 18, 2005–AWS: Chris Bosh & Scott Lost defeated Hook Bomberry & Lionheart..
July 9, 2005–Pro Wrestling Guerrilla: Scorpio Sky & Quicksilver defeated Scott Lost & Chris Bosh to win the Tag Team titles..
July 23, 2005–Battle Ground Pro Wrestling: Human Tornado defeated Chris Bosh..
August 6, 2005–PWG: El Generico & Human Tornado defeated Scott Lost & Chris Bosh to win the vacant Tag Team titles! ~~~El Generico & Human Tornado are known as “Two Skinny Black Guys” and Scott Lost & Chris Bosh are known as “Arrogance”..
August 19, 2005–Pro Wrestling Guerrilla: Christopher Daniels defeated Chris Bosh..
September 3, 2005–Pro Wrestling Guerrilla: Chris Bosh defeated El Generico in the 1st round of the Battle of Los Angeles..
September 4, 2005–Pro Wrestling Guerrilla: Chris Bosh defeated James Gibson in the 2nd round of the Battle of Los Angeles..
~~~Chris Bosh defeated Quicksilver (3rd Round) | Chris Bosh defeated A.J. Styles to win the Battle of Los Angeles Tournament..
September 24, 2005–AWS: Human Tornado defeated Chris Bosh..
October 1, 2005–Pro Wrestling Guerrilla: Kevin Steen defeated Chris Bosh by Disqualification..
October 14, 2005–Pro Wrestling Guerrilla: Kevin Steen won three-way over Chris Bosh and A.J. Styles..
November 18, 2005–Pro Wrestling Guerrilla: Dino Winwood & Scorpio Sky & Quicksilver beat Joey Ryan & Scott Lost & Chris Bosh..
November 19, 2005–Pro Wrestling Guerrilla: Kevin Steen defeated Chris Bosh to retain the PWG Heavyweight title..
January 7, 2006–Pro Wrestling Guerrilla: Chris Bosh defeated Scott Lost..
January 21, 2006–Pro Wrestling Guerrilla: Chris Bosh defeated Joey Ryan (PGW Champion) by Count Out ..
~~~After the match, Kevin Steen & Chris Sabin & Chris Bosh shaved Joey Ryan’s mustache into a Hitler style..
February 4, 2006–PWG: Joey Ryan defeated AJ Styles and Chris Bosh and Kevin Steen in a 4-WAY to retain the PWG title..
February 18, 2006–Pro Wrestling Guerrilla in Europe: “Mr. Wrestling” Kevin Steen defeated Chris Bosh..
February 19, 2006–PWG in Europe: Super Dragon & Davey Richards defeated Chris Bosh & Scott Lost to retain the Tag Team titles..
March 4, 2006–PWG: Chris Bosh & Scott Lost defeated El Generico & Quicksilver by DQ when PWG Champ Joey Ryan interfered..
March 18, 2006–Pro Wrestling Guerrilla: El Generico & Quicksilver defeated Scott Lost & Chris Bosh…..
March 25, 2006–Ultimate Pro Wrestling: Chris Bosh defeated Andrew Hellman..
April 8, 2006–Pro Wrestling Guerrilla: Joey Ryan defeated Chris Bosh and Super Dragon in a 3-WAY to retain the PWG Title. May 6, 2006–PWG: Chris Bosh/Scott Lost/Chris Hero/Claudio Castagnoli beat El Generico/Quicksilver/Kevin Steen/Super Dragon. 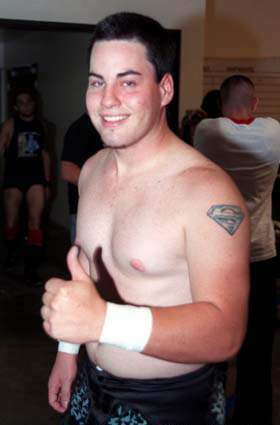 May 20, 2006–Pro Wrestling Guerrilla: Chris Bosh & Scott Lost beat Davey Richards & Super Dragon to win the Tag Team titles..
June 3, 2006–Pro Wrestling Guerrilla: Scott Lost & Chris Bosh beat Human Tornado & B-Boy to retain the Tag Team titles..
June 24, 2006–Pro Wrestling Guerrilla: Chris Bosh defeated Frankie “The Future” Kazarian..
August 12, 2006–Rising Phoenix Wrestling: Chris Bosh defeated Ronin.. … … … … … . September 2, 2006–PWG: Arrogance (Scott Lost & Chris Bosh) defeated The Briscoes and Homicide & B-Boy in a 3-WAY..
September 29, 2006–IWA Mid South: El Generico defeated Chris Bosh in the 1st Round of the Ted Petty Invitational..
October 7, 2006–PWG: Super Dragon & B-Boy defeated Chris Bosh & Scott Lost to win the PWG Tag Team titles! October 21, 2006–Pro Wrestling Guerrilla: Chris Bosh defeated Human Tornado. … … … . November 17, 2006–Pro Wrestling Guerrilla: Candice LeRae‘s Team defeated Jade Chung’s Team in an 8-Man Tag..
~~~Frankie Kazarian/Human Tornado/El Generico/Quicksilver beat Joey Ryan/Chris Bosh/Scott Lost/Scorpio Sky..
November 18, 2006–Pro Wrestling Guerrilla: Arrogance (Chris Bosh & Scott Lost) beat Frankie Kazarian & M-Dogg20..
January 13, 2007–Pro Wrestling Guerrilla: Kevin Steen defeated Chris Bosh in a #1 Contenders match..
February 10, 2007–Pro Wrestling Guerrilla: Chris Bosh defeated Claudio Castagnoli..
February 17, 2007–CHIKARA Trios Tournament: Pantera/Sicodelico Jr/Lince Dorado beat Joey Ryan/Scott Lost/Chris Bosh..
June 8, 2007–United Wrestling Federation: Arrogance (Chris Bosh & Scott Lost) defeated Team MACKtion (Kirby & T.J. Mack)..